The recently finished European SSL-erate project has successfully supported the uptake of high-quality Solid State Lighting (LED lighting). Over a period of three years, the project promoted opportunities for broader SSL uptake based on green, sustainable SSL business development and the positive effects of lighting on health and well-being. The SSL-erate project has actively contributed to fostering the emergence of new related businesses across Europe, especially at a regional level. Through workshops and business development experiments, which involved companies, customers, end-users and regional lighting clusters, the SSL-erate project achieved cooperation along the SSL value chain and between professional users and the lighting industry. This included the lighting sector, architects, installers, the buildings and construction industry, business entrepreneurs, specific end user groups (cities/municipalities, property owners, consumers) and indirect stakeholders (e.g. from healthcare, education, or the insurance sector). The project also created the online platform lightingforpeople.eu which provides customer guidance for optimum utilization of LED, carried out a series of outreach actions for the wider European public, and actively supported European Commission initiatives and events launched as part of the Commission’s overall SSL policy. 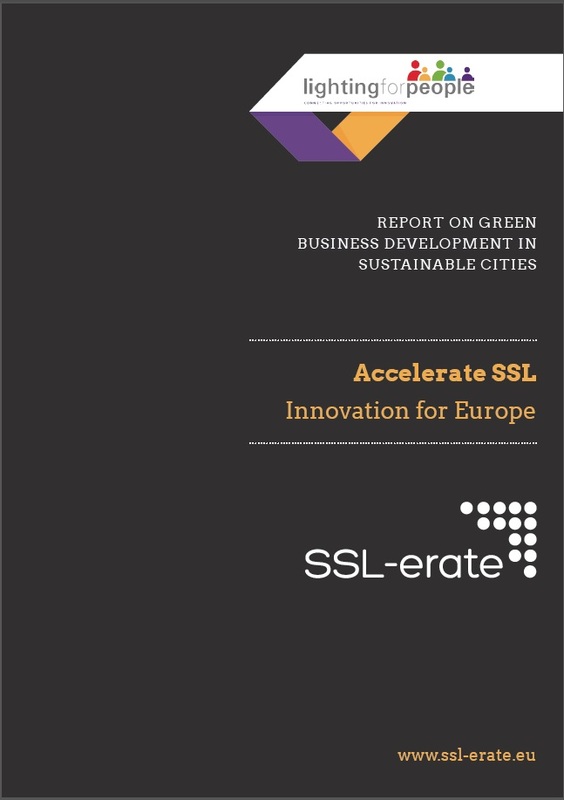 Report on Green Business Development in Sustainable Cities: This report describes the progress in green business development related to SSL lighting by cities during the SSL-erate project, and provides recommendations and background for “how” the deployment of high quality SSL can be accelerated. The report also illustrates the more basic aspect of « why » it is so important for cities to build awareness and invest in more advanced lighting and intelligent lighting systems. Read it in full here. Report on the effect of lighting on human health and well-being: This report is based on an analysis on the effect of lighting on health and well-being, drawing together conclusions from hundreds of research papers compiled and summarised by the experts within the project consortium. This analysis covers the effect of light on health and well-being across a number of different applications, including healthcare, the workplace, the home, schools and educational institutions, and cities. It provides a basis to learn about how light can affect the human body, what the potential consequences of these effects are, and how can we use this information to create truly human centric lighting. Read it in full here. 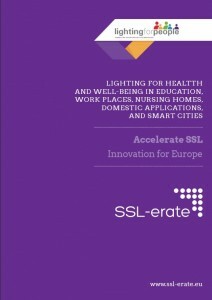 SSL-erate is co-funded by the European Commission as part of the Seventh EU Framework Programme for Research and Technological Development under Grant Agreement No. 619249. Twenty-four partners, including LUCI, participated in this three-year project. They consisted of lighting clusters, universities, cities, industry and media. The project focused on human centric lighting, open innovation and sustainable development. The project was coordinated by the Dutch research organization TNO.